Remi Garde became the manager of Aston Villa back on November of 2015 as he replaced Tim Sherwood but even though the French coach has only been in charge of the Premier League club for around 4 months, he is already on the brink of getting removed from his managerial position at Villa Park. Aston Villa’s latest result saw them losing against Swansea City with a final scoreboard of 1-0 in favour of the home team and this is the 6th successive defeat for the team of Remi Garde as they continue to struggle trying to secure triumphs on a consistent basis. The season is almost approaching midway, but Aston Villa have managed only one win in the league so far. This disastrous form sees them already cut off from the 19th placed team in the Premier League – Sunderland. 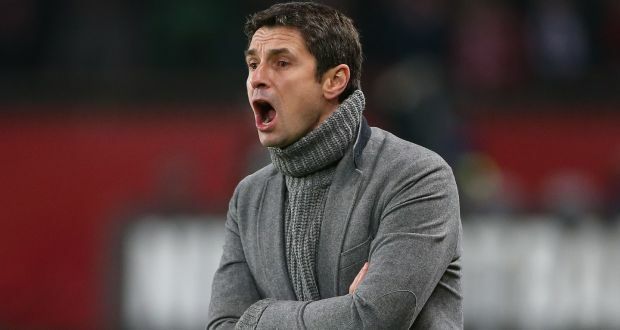 Remi Garde was brought into improved results, but almost no positivity has been experienced by the team since he replaced Tim Sherwood in November. It remains to be seen if any arrivals in January will help the team. For the time being, the manager has to place his belief on the existing group of players. One of the promising names in the squad is Ghana star Jordan Ayew. Aston Villa received a major boost with the news that captain and midfielder Fabian Delph was snubbing the offer from Manchester City to stay at Villa Park. The England international has been linked with a move to City for around £ 8 million – the release clause in his contract. Delph only signed a new contract only back in January and he stated that he was going to be part of the club for a long time. However, there were rumours that the midfielder was undergoing a medical at City after the Manchester outfit activated the release clause. This rumour appears to have had some truth. During the previous season of the Premier League, Aston Villa managed to avoid getting relegated as they had an advantage of 5 points which kept the team of Paul Lambert safe. The manager of Aston Villa believes that this season should be easier to avoid being pitted in the bottom spots of the Premier League if his squad continue performing in the way that they have been doing up until now. Aston Villa has claimed victories against Crystal Palace, Leicester City, Liverpool, Stoke City and Hull City which has helped the club in maintaining a fairly comfortable spot in the middle section of the Premier League standings. Aston Villa boss Paul Lambert has claimed that the club will be undergoing a major rebuilding work in the summer, but he is aware that it will definitely not be easy. The former Norwich manager has come under intense pressure after two successive years of poor form. Aston Villa have only narrowly managed to avoid relegation at both these campaigns, which have led to calls for the manager to be sacked. However, a more important situation arose towards the end of the season after owner Randy Lerner confirmed that he was putting the club up for sale. Aston Villa suffered a 4-0 defeat against Manchester city in the penultimate game of the season. This was yet another disappointing result for manager Paul Lambert, who has come in for intense criticism. Since the former Norwich manager replaced Alex McLeish, they have been struggling against relegation for the last two seasons. However, this season’s struggle has been compounded by the rumours that owner Randy Lerner is reportedly set to sell the club after they have secured another season of Premier League football. Alan Hutton has been a player of Aston Villa since 2011 but has only managed to make 31 appearances for the Premier League club as he was offloaded to Nottingham Forest and Mallorca. After his loan spell with Mallorca came to an end, the Spanish club attempted on signing Hutton on a permanent deal but could not afford it and now he has made his return to Aston Villa to where he still has not made a single appearance in this season and it does not seem like its going to change anytime soon. The head coach of Aston Villa, Paul Lambert has told Alan Hutton that his career in the club is over because of his wages, which are simply just too high. Aston Villa striker Gabriel Agbonlahor has said that the match with West Brom on Monday night is going to be of massive importance. The Midlands derby could potentially see West Brom building on their recent run of form, which has seen them take a credible 2-2 draw against Chelsea just before the international break. They could have easily taken three points from this encounter had it not been for the last-minute penalty, which was very controversial. After a good start to the season, Villa have slipped into an inconsistent spell in recent weeks. The Aston Villa manager Paul Lambert has described that the summer signing Christian Benteke is a special type of player. The 21-year-old scored in the recent match against Reading to give Aston Villa all three points and also some respite from the immediate threat of relegation. When the manager Paul Lambert arrived at the club in the summer, he stated that the England international Darren Bent was one of the important members of the squad. He also made the £ 24 million signing his captain, but the former Tottenham striker has rarely featured in recent weeks.